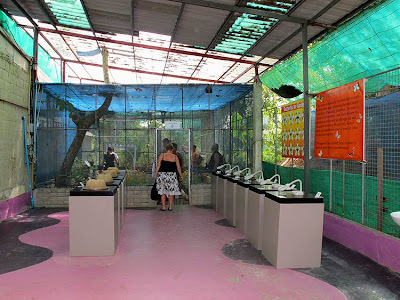 A last-minute decision on the choice of a short vacation with my wife led us to choose Phuket, an island paradise in Thailand that we last visited back in 1997. 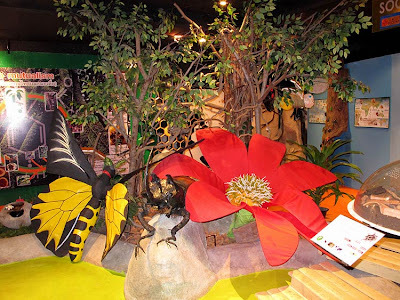 As can be expected during this holiday period, flights were packed and hotels were fully booked. 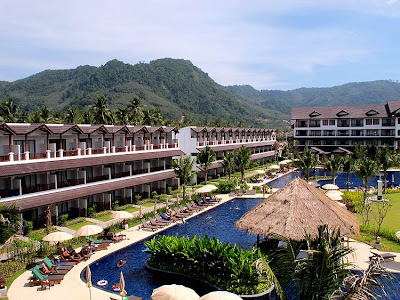 However, we were fortunate to get tickets on the low-cost airline JetStar, and secured reservations at a newly completed wing of the Kamala Beach Resort. 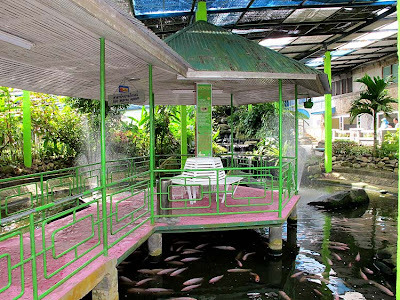 The island resort was packed with holiday-maker tourists from continental Europe, Australia and the US. 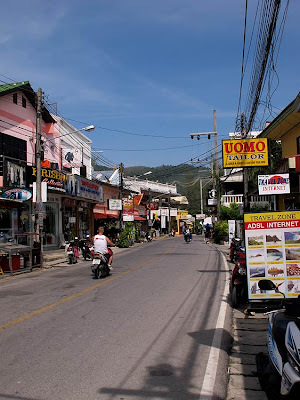 As we were walking around the little shops around the Kamala Beach area where we stayed, it was almost like visiting a city in Europe, surrounded by mainly non-Asians (other than the Thais, of course)! There were very few Asians around, and most of the friendly locals were busy with the tourist season and also the celebrations that came with the start of the first year of a new decade - 2010. The world-renown Thai hospitality was exceptional, and I can say that very few countries have locals who are so sincerely friendly and honest. With a ready smile and the welcoming greeting "Sawadee kap" everywhere we went, it was refreshing that we felt rather safe in a country that is recently rife with political protests further up north in the Thai capital of Bangkok. The taxi drivers spoke relatively good English (which can be expected, since English is the common communication language of most foreign tourists) and are honest. 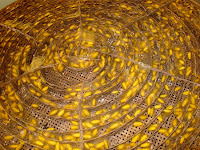 For us, after a bad experience with the taxi drivers in Kuching, we were rather cautious about bargaining for fares, after being advised by the hotel staff what the going rates were. 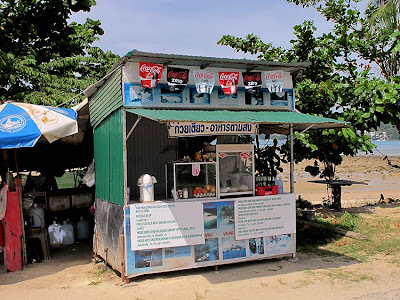 A roadside hawker stall where we had lunch on our first day. It served very good Phad Thai noodles! However, our fears were unfounded as the two taxi drivers that we encountered quoted very reasonable rates, and one was willing to even wait for us at an appointed place, even though we could have just reneged on our deal and desert him. But as I told my wife, the Thais have a strong belief about bad karma, in that a person who does bad things will suffer just retribution for his misdeeds. Phuket, at about 570 sq km, is Thailand's largest island. 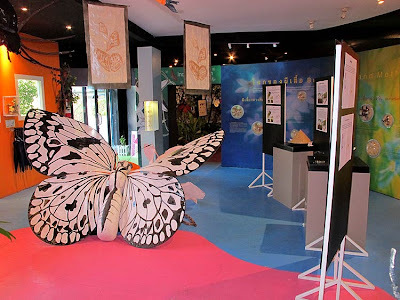 Phuket's topology is exceptional with 70 percent of its area covered with mountains (the tallest peak is 529m above sea level) which stretch from north to south and the remaining 30 percent being plains located in the central and eastern parts of the island. The island does not have any major rivers except for a total of 9 brooks and creeks. 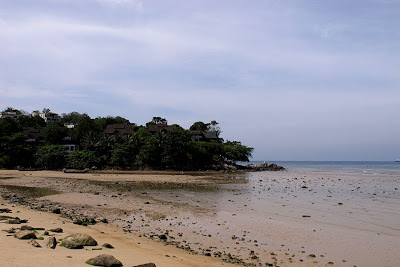 The island has many beaches and the number of hotels and resorts is mind-boggling. 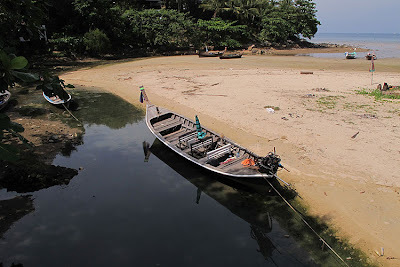 Tourism appears to be the main source of income for the locals, where all sorts of outdoor activities like diving, island hopping, trekking and so on form most of the tourist activities. 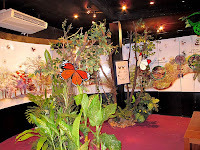 Many shops sell the local Thai handicraft and souvenirs, local foodstuff, and also the 'forbidden fruits of modern technology' - pirated DVDs, which can be had for just 100 Baht (or just slightly more than S$4). I noted that the recently launched movie blockbuster, Avatar, was amongst the DVDs being peddled! 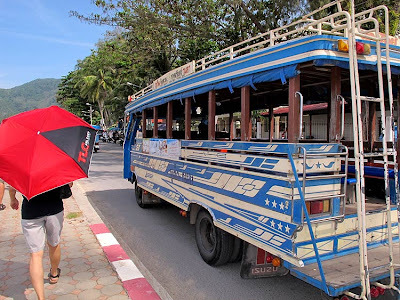 Cheap transport is available with the local buses plying the main routes around the island. 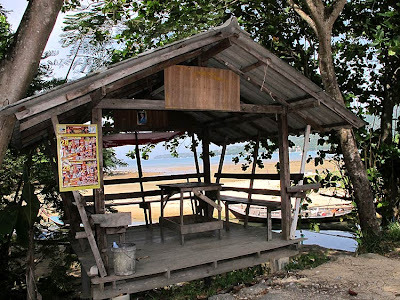 The bus shelter is a far cry from Singapore's spanking steel and glass bus stops, but is appropriate for the rustic island. The famous (or should I say, infamous?) Patong Beach, where most of the island's colourful nightlife and shopping is located, is always a must-visit destination for the thousands of tourists to Phuket. 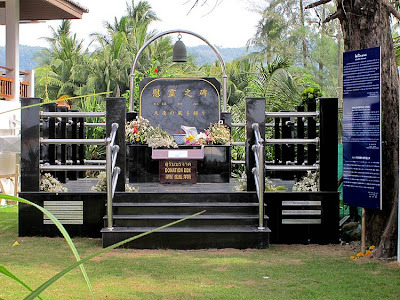 As we were walking along the beach at Kamala, we saw several memorials erected for the people who perished as a result of the 26 Dec 2004 tsunami that hit the island. 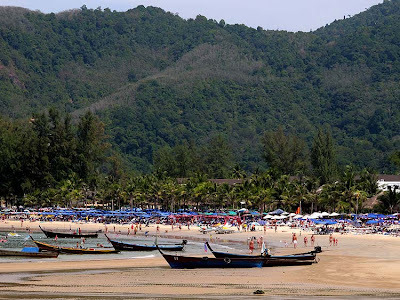 Then, about 5,300 people perished in Thailand in various areas, and many of the Phuket resorts and less robust buildings were wiped out by the massive waves that hit many parts of Asia as a result of the Indian Ocean earthquake. 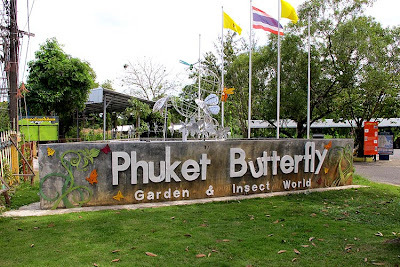 Unlike many of my previous travels, due to our short stay in Phuket, we decided to skip the rougher mountain treks, and opted to visit the local butterfly park instead. 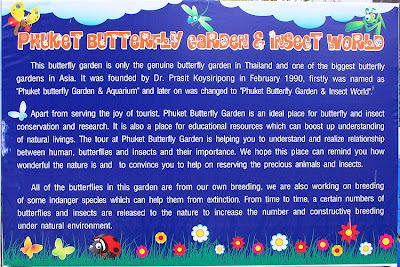 The Phuket Butterfly Garden is located towards the south of the island, near Phuket Town. 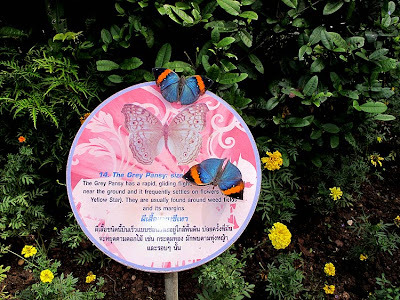 A sign at the garden explains the history of the garden, which claims to be "the only genuine butterfly garden" in Thailand. 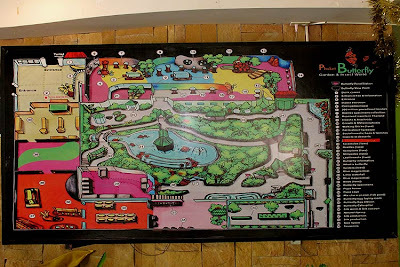 It was founded by Dr Prasit Koysiripong in Feb 1990. 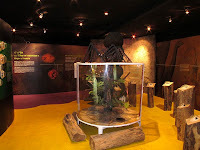 The renovated premises featured more educational exhibits with a strong conservation message. 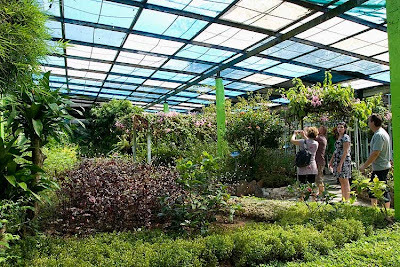 The flight cage, which is about the size of the Penang Butterfly Farm, features lush landscaping and water features. 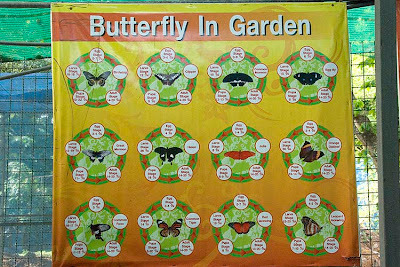 There are areas which display the early stages of the species found in the garden, and lots of information on butterflies. 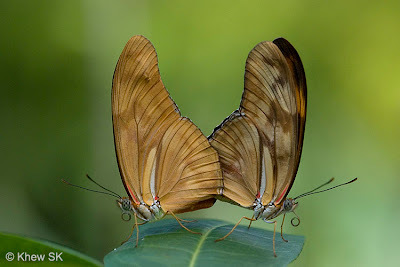 The breeding of the South American Julia Heliconian (Dryas iulia) appears to be still as successful as during my last visit in 1997, and the species is common in the Phuket Butterfly Garden. 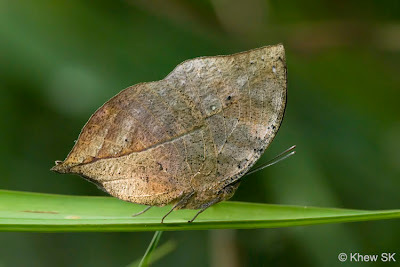 The flight of this species always reminds me of a helicopter, with the long wings flapping ceaselessly as the butterfly flutters around looking for nectar. 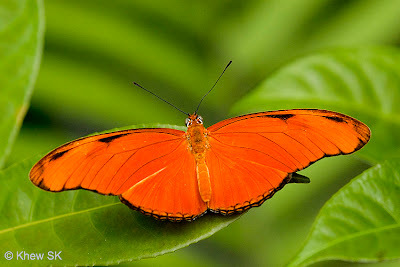 It is a skittish butterfly, and is not easy to get a good photo of, especially during a hot sunny day. 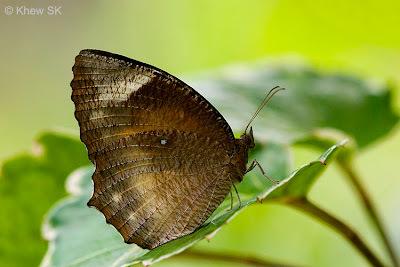 It is likely this subspecies that has made its way down south to Malaysia where ButterflyCircle members saw it on a recent trip there in Pulau Langkawi. 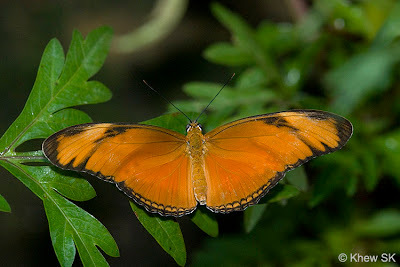 As with many butterfly gardens in Asia, the larger and more showy species, like the Taiwanese Tree Nymph, Dark Blue Tiger, Leopard Lacewing, Clipper, Leaf Butterfly, Scarlet and Great Mormons, and the more common local species like the Common Mormon, Tailed Jay, Lime Butterfly were featured in the flight cage. 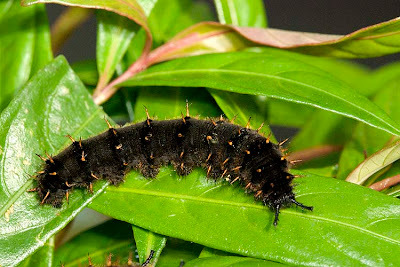 The caterpillar breeding section showed several of the more common species found in the garden, including many interpretative signage to explain the species being bred and the life cycle of the butterflies. 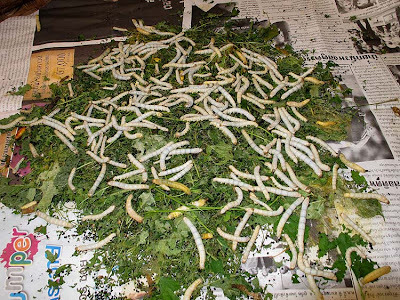 A section featured sericulture - the rearing of silkworms in order to obtain raw silk. 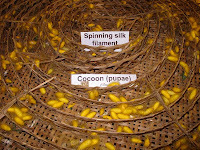 Typically using the larvae of Bombyx mori, silk is harvested from the pupae of the moth and weaved into the final product that is famously sold all over the world - Thai silk. Our New Year's Eve was spent with a quiet dinner at Kamala Beach after a tiring day of shopping at Phuket Town. 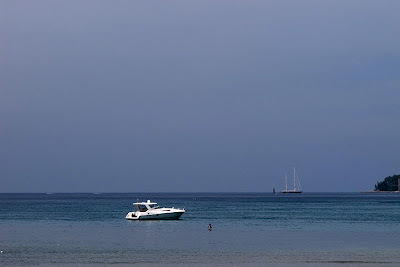 As expected, the resorts were packed with party-goers and tourists all bent on celebrating the dawn of a new decade. The fireworks started at 11pm and continued way past midnight. It was amazing, the amount of fireworks that were blasting all around us, heralding the start of a new year and a new decade.